pedit5, alternately called The Dungeon is a 1975 dungeon crawl video game developed for the PLATO system by Rusty Rutherford. It is considered to be the first example of a dungeon crawl game, believed only to be preceded by a game named m199h listed among some PLATO lesson lists but which no copies exist to affirm. In the game, the player guides a character who wanders a single-level dungeon accumulating treasure and killing monsters. When a player encounters a monster, he can use one of several spells. Characters can be saved from one play session to the next. The dungeon was rendered using on-screen character graphics. 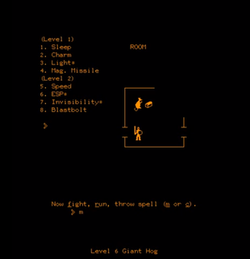 Though the dungeon presents a fixed layout, the monster encounters and treasure were randomly generated, making it an early predecessor of the roguelike genre. pedit5 was created by Rutherford while he was a member of the Population and Energy Group at University of Illinois, Urbana-Champaign. There, each group was assigned a limited number of program slots on the school's mainframe, with the Population and Energy Group having program slots names "pedit1" through "pedit5". The group had used the first three slots, and Rutherford was able to code his game into the fifth slot, which became the game's default name. Because at the time the game was not seen to be an appropriate use of the resources by system administrators Pedit5 was eventually deleted, but Rutherford would continue to add it back. A new version of the game, based on the original work but significantly improved, was written by three other programmers as orthanc, named after a tower in The Lord of the Rings. The original version of pedit5 was resurrected as orthanc1. Both orthanc and orthanc1 remained on the PLATO system. Since then, copies of the game's source code have been made available allowing users to play the title on the PLATO (Cybis) system, or an emulator of it, connected to the Internet. ^ a b Rusty Rutherford (31 August 2008). "The Creation of PEDIT5". Armchair Arcade. ^ a b c Brewer, Nathan (July 7, 2016). "Going Rogue: A Brief History of the Computerized Dungeon Crawl". Insights. IEEE USA. Retrieved September 15, 2016. This page is based on the Wikipedia article pedit5; it is used under the Creative Commons Attribution-ShareAlike 3.0 Unported License (CC-BY-SA). You may redistribute it, verbatim or modified, providing that you comply with the terms of the CC-BY-SA.